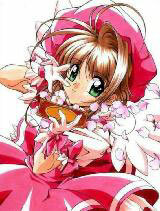 You are going to Watch Cardcaptor Sakura Episode 26 English dubbed online free episodes with HQ / high quality. Stream Anime Cardcaptor Sakura Episode 26 Online English dub Sakura and the Wonderful Teacher, On her way home Sakura bumps into a woman in the street. After arriving at school the next day, Sakura discovers that her maths teacher will be on extended vacation and the replacement it the woman she bumped into the day before, Ms Mizuki. During the lunch break Syaoran reveils to Sakura and Tomoyo That the substitute has a strong magical presence and that they should be careful around her. When School Finishs Sakura and Tomoyo go to a shrine to pick up a romance charm. Upon arriving Sakura feels a presence. While at the Shrine they also see Meilin and Syaoran.